Suet is the hard but flaky fat found on the inside of a cow or sheep around the kidneys and that area of the body. Now, I am well aware that many good things are made with fat, or even lard for that matter. But I am one of those people who believes that ignorance is bliss. I can enjoy something made with lard as long as I don't know that there is lard in it :) So, even though I am sure that traditional British pudding made with suet is delicious, I simply could not bring myself to make anything with it! For this challenge my rice cooker came in really handy. You see, it comes with a steamer insert that made steaming my pudding a piece of cake (no pun intended). The only problem was that the steamer is fairly shallow, so I couldn't put a large bowl in it. So, I decided to use ramekins and make mini versions instead. In the end, the ramekins simplified things for me, as I didn't have any string on hand so I had to improvise. 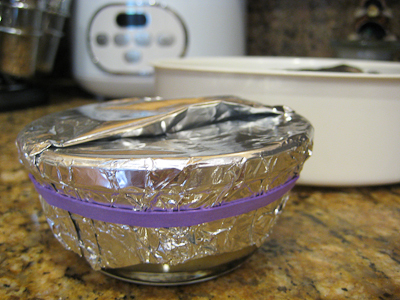 Instead of using string to seal the foil over the ramekins, I used rubber bands. Here's how my pudding looked after it was done steaming! I was a little worried about how this would taste, as I am fairly certain that every sticky toffee pudding I've ever tried was baked, not steamed. I am not sure why, but the thought of eating a dessert that was steamed just seemed weird to me. Luckily, I found my concerns to be completely unfounded - this was delicious! My husband even told me to hide the rest from him because he's trying to lose some weight and didn't want to eat all of it! I've included the recipe I used below, though I apologize to those who do not have a kitchen scale. I intended to measure everything out so I could include it with the recipe but was rushed and did not get the chance to do this. You may want to use this link to figure out the conversions. Thanks Esther, for hosting this month's challenge. 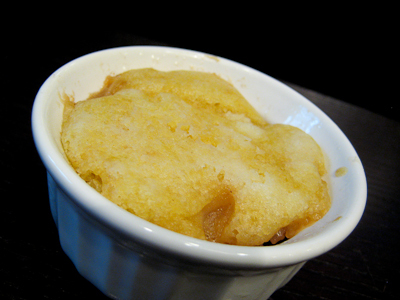 I'm sorry I wasn't "daring" enough to make a pudding with suet, but I did challenge myself to try steamed pudding. Make sure you check out the Daring Bakers' Blogroll to see how everyone else enjoyed this traditional British dessert. Melt 25g butter in a large frying pan, add the apple chunks and cook until just tender and starting to turn golden. Add 1 tbsp sugar and continue to cook for a couple of minutes until the apples start to caramelize. Cool and add the walnuts. To make the sauce, tip all of the ingredients into a saucepan and cook until the butter and crème fraîché have melted. Bring to the boil and simmer for 2 minutes. Tip the apple and walnut mixture into a buttered 1.5 litre pudding basin. Pour a third of the toffee sauce over, set aside. Beat together the remaining butter and caster sugar until pale and creamy. Gradually add the beaten eggs, mixing well between each addition. Fold in the flour with a pinch of salt. Carefully spoon the mixture on top of the apples and spread level. Cover with a pleated sheet of baking parchment and foil, tie securely with string and trim off any excess paper and foil. Put the bowl in a large saucepan and pour boiling water around the bowl so that it comes halfway up the sides. 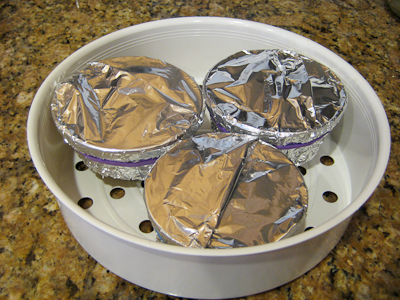 Cover with a lid and steam for 1-1/2 hours, adding more water to the pan halfway though if needed. Rest the pudding for 2 minutes before turning out into a dish and serving with the remaining warm toffee sauce. 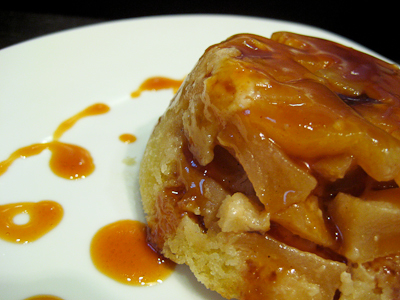 Oooh apple and sticky toffee? Yum! Your challenge offering looks great! I'm with you, I'll bet the suet was delicious in it but I wouldn't be able to put it in either. This looks excellent! Your pudding is gorgeous! I went with a chocolate version and while it was good,it was not pretty! haha Great job! That looks great! I love the idea of apples and toffee. Nice job on the challenge! This looks many steps ahead of the other pudding's I've seen! It looks delicious, I love anything with apple and cinnamon! I made the same recipe - it was really good. Yours looks great! 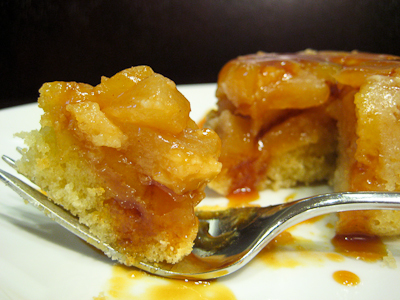 Apple sticky toffee pudding sounds good to me! 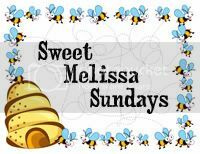 Good for you for managing to get your DB and TWD posts up on the same day! I didn't do TWD this week, but I did use suet (and it was not that pleasant). I'd like to fall in love with sticky toffee pudding while vacationing in Grand Cayman too. It sounds like a fabulous combination and looks so delicious. I couldn't bring myself to use suet either. Your pudding looks lovely and will be perfect for fall when all those apple dessert are calling my name. You had me at "pudding". And "toffee". And apples and cinnamon! This dessert is basically all of my favorite things! I had something similar at a fancy shmancy restaurant in New York- now I can't wait to do a gorgeous homemade version! 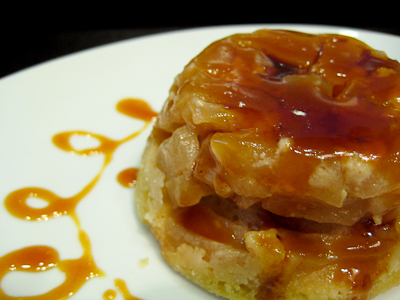 Apples and toffee sauce...mmm... Those look so good! I've been wanting to make sticky toffee pudding for FOREVER! How cool that you made it (sorta). Now I know it's totally doable. My rice cooker has a steamer insert. It's meant to be! I even bought the dates a coupla weeks back to give it a try. Steamed sticky toffee pudding is now on this weekend's to do list! Yea!